AMC's re-branding, record-breaking beast with sporty looks and the power to back it up. American Motors, always at a disadvantage financially compared to the Big 3, arrived late to the pony car party. It wasn’t until 1968 that they fielded a true contender, the Javelin. Shortly after that introduction, they chopped off 12” of wheelbase, took out the back seat, and presto, an AMX is born. A little simplification, but not much. 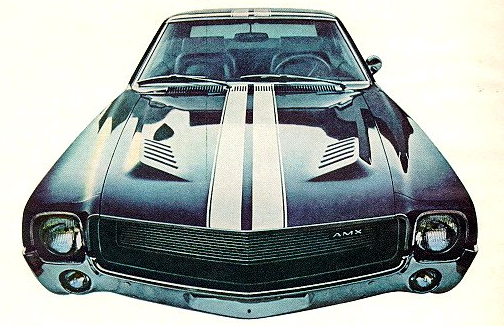 The AMX sported a standard 290ci 4-barrel V8 with 225hp, but you don’t see too many of those. Up one notch was the 343ci 4V at 280hp and at the top of the option sheet was the 390ci V8 with 310hp. Standard fare included a 4-speed manual transmission (automatic available), front disc brakes, special suspension, and of course, an appearance package. Look for the “Go Package” (not available with the 290) and it's upgraded suspension, posi rear, heavy duty cooling, tach, 140mph speedo and redline tires. The “Big Bad” color option helps in the muscle image department, though we haven’t seen a measurable effect on values. A facelift greeted buyers in 1970, along with a revised (and improved, we think) dash. The 290 was dropped, and a 360ci V8 replaced the 343. Values are about the same as the earlier models. AMC products almost always lag in market value but the AMX and the special Javelin editions have been making a run of late. The time to make easy money is probably past, but they’re a unique and fun ride. AMC Advertisement for the 1968 AMX. AMC Advertisement for the 1961 Javelin / AMX. 1971 marked the second generation and made AMC Javelin longer, wider, lower and heavier. The revised design was a bit Mustang Mach1-like, but also was quite unique. It had roof spoiler, fender bulges, revised front fenders and grille with the driver orientated dashboard. AMC offered Javelins with a few engine and transmission options. The T-10 transmission came with a shifter from famous Hurst company. The engine range for the second generation was: 232 cubic [3.8 liter, 135 HP], 258 cubic [4.2 liter, 150HP] I-6s and 304 cubic [5.0 liter, 210 HP], 360 cubic [5.9 liter, 245-285 HP], 401 cubic [6.6 liter, 335 HP] V8s.The 1971 Javelin was advertised as “the closest thing you can get to a Trans-Am champion”. This slogan sounded like real truth with a 6.6 liter engine which made Javelin to finnish a 1/4 mile in mid-114 secs at 93 mph [150 km/h]. The 1972 model was innovate – AMC was the first one to offer 12.000 miles or one year warranty with a free loaner car if the repair took more time. The 1972 and 1973 model were offered in Pierre Cardin interior trim that had multi-color stripe pattern. The 1973 Javelins were slightly changed with the most noticeable changes in taillights and front grille, completely flat roof [with vinyl option available]. When the market decreased other pony car manufacturers fitted smaller engines while AMC continued using big ones until the production ended in 1974. However, AMC were sold in respective numbers that outsold Barracudas an Challengers that are so popular nowadays.